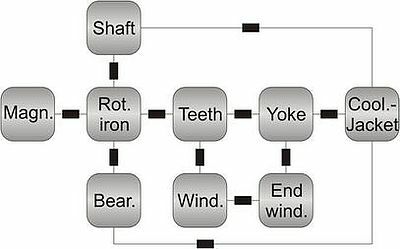 Due to its high power density and very high efficiency, the permanent magnet synchronous machine (PMSM) is the preferred motor topology in today's automotive applications. One major distinctive criterion is the location of the magnets. PMSMs with interior or buried magnets, so-called IPMSM, have an even higher power density than those with surface-mounted magnets (SPMSM), which represent the standard in industrial applications so far. This advantage can be ascribed to strongly asymmetric reluctances in IPMSM, which make the modeling and control design more complex, however. A typical control structure for an electrical drive system is depicted in Fig. 2. With respect to the achievable control performance, it has been proven to be advantageous to control the IPMSM in rotor-fixed coordinates. The crucial components in this context are the current controllers, which guarantee that the actual (measured) currents in the motor follow their reference provided by the operating point selection block. The design of the controllers can be performed in various ways, strongly depending on the required dynamics, robustness and available computation power. In this context, precise machine models, which account for varying inductivities due to iron saturation, can be utilized in the control design to improve the overall control performance. Therefore, LEA developed a semi-automatic method to generate motor specific LUTs through offline measurements. A further challenge lies in the rather small number of sampling instants per electrical rotation, especially at high motor velocities. In this context, advanced model discretization techniques, <del cite="mailto:DEFIGGH" datetime="2011-08-11T14:19"> </del>along with measures such as regular sampling become crucial to maintain a good control performance. The reference operating points are selected by taking into account the desired torque T*, the DC-link voltage uDC, the electrical angular velocity wel as well as the previously generated motor-specific LUTs. Fig. 3 displays such a LUT. Regarding the constant torque trajectories (green), it becomes obvious that mapping the torque to an operating point i*d, i*q is not unique. The degree of freedom can, however, be made use of to select an 'optimal' operating point within the reasonable operation range (yellow), while taking into account the given current and voltage limits (red and purple). Therefore, a target function representing the optimization criteria needs to be determined. Possible criteria are the minimization of ohmic losses (Maximum Torque per Current - MTPC) or total losses (incl. iron losses) in the motor (Maximum Efficiency - ME). In order to protect the motor from heating up beyond its specified limits or to include temperature variations in the operation point selection, the acquisition of temperatures at spots of interest (e.g. magnets, stator windings) becomes necessary. In order to avoid costs related to the employment of temperature sensors, model-based approaches are preferred. 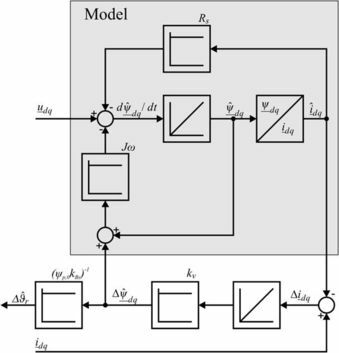 Figure 4 and 5 show two examples for a model-based temperature acquisition. In Fig. 4, the rotor temperature is detected via an observer structure based on the voltage equations of the IPMSM. 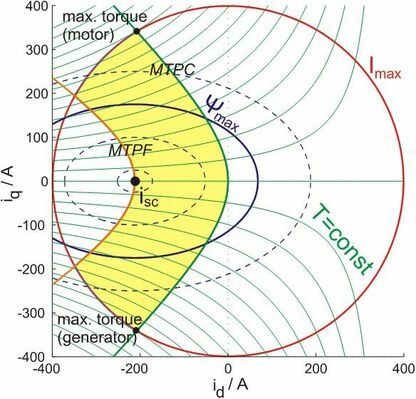 The idea is to utilize the temperature dependency of electrical variables, such as the resistance of the stator windings or the permanent magnet flux, to deduce temperatures from parameter variations. In Fig. 5, on the other hand, a generic Lumped Parameter Thermal Network (LPTN) is depicted. Those LPTNs can describe the actual thermal characteristics of the motor. Both approaches have unique advantages and drawbacks, for which reason they are both part of our research focus.